Need a Release Liner Manufacturer? We’ve Got You Covered! A release liner is a release liner is a release liner…they are all the same, right? Wrong! Whether you are using a simple, straightforward production process or engineering something for a very intricate, complicated methodology, choosing the right release liner and the right release liner manufacturer can make a big difference in run rates, waste, and overall profitability. 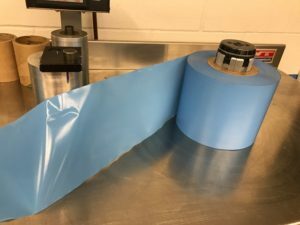 Getting a professional analysis done by a team of experts from a release liner manufacturer that is experienced in figuring out exactly what is needed can make a BIG difference. Gasket Engineering has helped companies replicate processes when they want to bring foreign-made part production back to the United States and streamline those manufacturing processes once they come back. 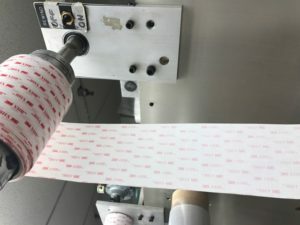 When it comes to picking the right release liner, there are several important factors to consider: material choice, release tension, adhesive type and application process. This is the most common and cost effective material. Most adhesives come with a paper liner. It is a fairly simple and easy-to-use product used for many applications. One downside to cutting against a paper liner, is that paper is soft and if you pass into the paper a little bit you can get tear-off. This occurs when you try to remove the part and the paper will delaminate, causing little pieces of paper to stick to the adhesive itself. For simple part production where nothing needs to be removed and no intricate cuts need to be made, paper is an obvious, cost-effective choice. This is the material used most frequently in the release liners Gasket Engineering produces and is a great choice for more intricate, kiss-cut parts. Polyester is not multi-layered, so this stronger, more flexible material never has a problem with tear-off or delamination. It is easy to cut and has excellent adhesion properties, yet is really easy for customers to peel off as needed. Mylar © is an example of a polyester release liner material. It is slightly more expensive than paper, but the extra cost is generally more than offset by the gain in loss of waste. A variety of plastic products can be used as release liners, including HDPE (High-density polyethylene) which is extremely strong against impact, abrasion resistant, and has a low coefficient of friction. Unlike polyesters which are normally clear, this product comes in various colors (usually blue), making it a good choice when vision equipment is being used in the application. In addition, HDPE is a bit softer and more flexible, which makes it a bit more forgiving than other solutions. The ease of release is another factor and is determined by the silicone release liner coating which can be easy, medium, or tight depending on the coat weight. The less silicone on the part, the tighter the release will be and vice versa. The substrate in the application also has a lot to do with the ease of release. Will it be a multi-line layer or single line layer? When customers need a one-sided silicone release liner, an easy release liner would usually be used. It’s a little trickier when you have a double release adhesive application as one side needs to come off easier than the other side. Once the customer has communicated how the product is going to be used, a determination can be made as to whether the second side will need easy, medium or tight release properties. 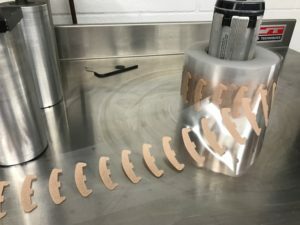 If needed, Gasket Engineering will send samples set at different coat weights so that the customer can test them out in their application and provide feedback on which silicone release liner worked best. This allows time to make the necessary adjustments to the release properties before going into full production. 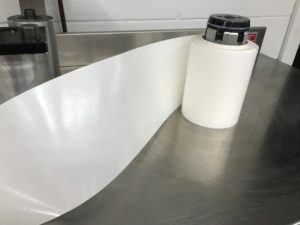 Of course, the final choice of material and release substrates will ultimately be determined by the application and manufacturing process being used. 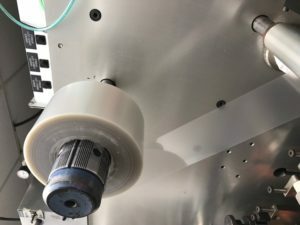 Do you need the product to be in rolls or on sheets? Is it hand-applied or done in line? This is where time and experience can be the most important factor of all. If the release properties are not correct, the part may come off too easily (and result in a mess of extra parts scattered on the production equipment or lying waste on the manufacturing floor) or conversely, not come off onto the part, resulting in inferior-quality company parts. With over 60 years of experience as a release liner manufacturer, Gasket Engineering knows what it takes to provide their customers with perfect parts every time. Call us today at 816-363-8333 and let us know how we can help.